PHILADELPHIA (AP) Ben Simmons foiled the Hack-a-Shaq strategy. 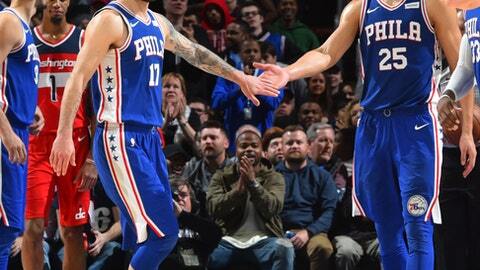 Simmons scored 31 points, grabbed a career-high 18 rebounds and overcame several intentional fouls, leading the Philadelphia 76ers to a 118-113 victory over the Washington Wizards on Wednesday night. After cutting a 22-point deficit to single digits with five minutes left, the Wizards started fouling Simmons, who entered the game shooting 56.6 percent from the line. He went 15 for 29, but made six of his last eight. His 24 attempts in the fourth were an NBA record for one quarter, according to ESPN Stats & Info, and the 29 overall set a league mark for rookies. Kelly Oubre Jr. scored 22 points and Bradley Beal and Jodie Meeks each had 21 for the Wizards (11-10), who have lost five of seven. The Wizards cut the deficit to 14 when Meeks hit consecutive 3-pointers. It was 96-88 when Washington began to send Simmons to the foul line. He missed four of eight free throws as Philadelphia’s lead dwindled to 100-97 with 3:35 to go. After Simmons made one and missed one, Embiid grabbed the rebound and got fouled. He made one of two. Beals then missed a jumper and Simmons again went to the line and made both, extending the lead to 104-97. ”It’s frustrating, but I trust Ben to step up and he did a great job,” Embiid said. Beal answered with a 3 before Simmons made two more free throws. Simmons then made one and missed one and Embiid fouled out, sending Beal to the line for three. He made all three. Tomas Satoransky’s short jumper trimmed Philadelphia’s lead to 116-113 with 11.4 seconds left, but Jerryd Bayless iced it at the foul line. Sixers coach Brett Brown said he considered removing Simmons from the game, but chose to let him work through it. Embiid blocked two shots in a six-second span in the first half. He also swatted Tim Frazier’s shot to start a fast break, took a pass from Simmons and threw down a dunk. Saric made the highlight reel by flipping a behind-the-back pass to Robert Covington driving for a layup a few minutes in. Wizards: Wall missed his third straight game with a sore left knee. 76ers: Embiid will sit out against Boston on Thursday because the team isn’t ready to have him play on back-to-back nights after he fought through injuries his first three seasons, missing the first two years. … Point guard T.J. McConnell exited the game with a bruised left shoulder. X-rays were negative but Brown doesn’t expect McConnell to play vs. the Celtics. Wizards: Host the Detroit Pistons on Friday. 76ers: Visit the Boston Celtics on Thursday.